The General Settings let you control how your site is displayed, such as the title, tagline, language, and visibility. Post Layout: You can choose your post layout has “Boxed” or “Wide”. Post Content Padding Option: This is common option for every page. 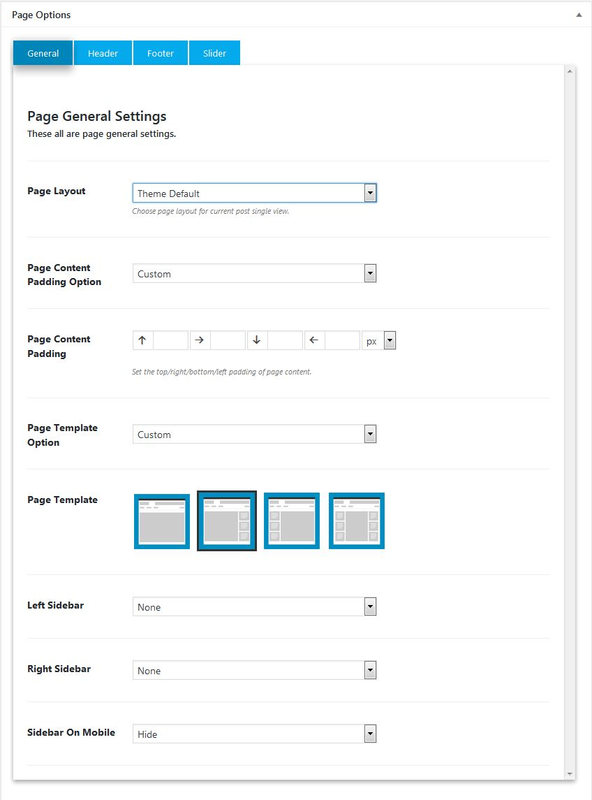 Choose your custom option mean you can set the top/right/bottom/left padding of content. Page if you not given any values here its get default value from styles. Post Template Option: Choose your post page template has “Custom” or “Themes Default”. If you select default, custom options are hide and not working. Custom Post Template: Choose your current post page template. Left Sidebar: Select your widget area for showing page on left sidebar. If you want to show left sidebar, then you must choose page template left sidebar or both sidebars. Item like secondary menu sidebar, footer1, and footer2 etc. if you not given any values means you can select “None” value. Right Sidebar: Select your widget area for showing page on right sidebar. If you want to show right sidebar, then you must choose page template right sidebar or both sidebars. Item like secondary menu sidebar, footer1, and footer2 etc. if you not given any values means you can select “None” value. Sidebar on Mobile: Choose Enable/Disable to show or hide sidebar on mobile. If you not give any, you can select default value. Featured Slider: You can Enable/Disable for single post featured slider. You can set slider settings at Slider -> Feature Slider tab. Full Width Wrap: Choose Enable/Disable to full width post wrapper. This is full width section, showing at before page content. Post Items Option: Choose your post item has “Custom” or “Themes Default”. Post Items: Needed single post items drag from disabled and put enabled part. Items like title, top meta, thumbnail, content and bottom meta. Post Overlay: You can Enable/Disable for single post overlay. Post Overlay Items: Needed single post items drag from disabled and put enabled part. Post Page Items Option: Choose your post item has “Custom” or “Themes Default”. Post Page Items: Needed post page items drag from disabled and put enabled part. items like title, top meta and bottom meta.